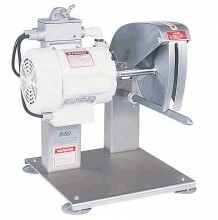 A poultry cutter gives you the ability to cut chicken, fish, rabbit, turkey and duck all day long! Cut your choice of meat as accurately as you want, with cutting blades sized to your needs! Shelf life maximized, as the poultry cutter slices instead of tears the product! Maximum productivity, and easy to clean! A must have for any butcher shop, restaurant or commercial kitchen!